Posted in Biography, Books	by Hi! I'm Jen. I have always been a C.S. Lewis fan. I love his fiction. I love his apologetics. And I am amazed both accounts of genius came from the same mind. 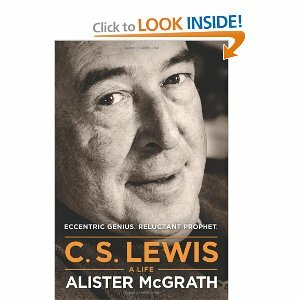 So, as a fan, I was really looking forward to reading a biography by such a heavy-weight academic as Alister McGrath. First, it’s a very academic accounting. It’s exhaustive in detail and explanation. McGrath not only tells you Lewis was born in Ireland, he tells you the implication of being a Protestant in Ireland just before the split of the country. And he explains the implications of being an Irishman not required to fight in the Great War but feeling compelled. This is a biography not only of facts but of academic implications based on extensive research. There were many aspects of Lewis’ life I had been familiar with before. But I was also introduced to new ideas and conclusions. For instance, for all his great apologetics, it was actually experience that converted Lewis to Christianity. As a young child, he had the sense to recognize the feeling of joy and wonder from where it come. That desire to understand joy ultimately led him through atheism to a belief in biblical Christianity. As well, it appears his writing of apologetics waned after World War II, in large part to his reasoning being challenged in the setting of an academic social club at Oxford. After that night, it is inferred, he lost his confidence in being an apologetics leader of the era. It was never his goal to write apologetics. He had just kind of gotten sucked into it. So it was also easy for him to leave. Lewis read veraciously as a child. The affects of which are numerous, but one of which was the creation of Narnia. McGrath goes into great detail regarding Lewis’ relationship with Tolkien and their distancing in later years. One of the most fascinating aspects of the book to me was the comparison and differentiation between the development and writing of The Chronicles of Narnia and The Lord of the Rings. Know this is an academic book, but if you are a Lewis fan, it is a must-read. McGrath does a really great job. Click on the photo of the book above to be taken to Amazon for your own copy. Buy it. Read it. Share it with someone else.